"Play and view flash files on Internet Explorer"
Flash is a very important technology for the internet, since many web pages contain many elements that use flash, such as animations, button, menus, videos and even games. Adobe Flash Player 11 for Internet Explorer is the official plug-in, which will allow you to play and to view SWF (flash) files. This plug-in is very easy to install and will integrate itself with Internet Explorer. 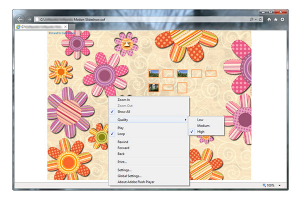 Once you have installed the plug-in, if you right click over an animation, you will be able to change the quality of the picture and can control the playback. Adobe Flash Player 11 for Internet Explorer brings many new improvements and increases its functionality. It now supports higher resolution BitmapData object,s which where previously limited to a maximum resolution of 16 megapixels. The plug-in can take advantage of 64-bit operating systems and web browsers on Windows, Linux and Mac. It supports the HE-AAC audio codec and the H.264 video codec, which offer a higher quality picture and clearer sound. These codecs also allow you to create and to playback HD flash videos. Please bear in mind that this version only support Internet Explorer.